Steroids can help relieve intense pain in the posterior heel and the Achilles tendon in patients with retrocalcaneal (RC) bursitis and/or Achilles insertional tendinopathy. Image guidance into the RC bursal space provides the benefits of precisely-targeted steroid injection into the synovial-lined bursal space. It also confidently avoids unintended intra- or peri-tendon Achilles injection, which may raise the risk of subsequent Achilles tendon tear. 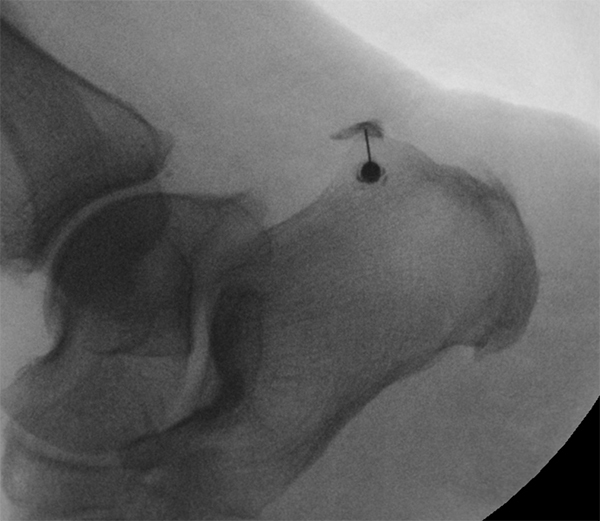 Radiologists and orthopedic surgeons at Montefiore Medical Center of the Albert Einstein College of Medicine in the Bronx, NY, describe the technique they utilize for fluoroscopically-guided injection into the RC bursa, and provide short-term outcomes of a small patient cohort in an article published in Skeletal Radiology. Ultrasound-guided injection into this space has been previously well described. The fluoroscopically-guided technique described in this report may be useful in practice settings where outpatient musculoskeletal procedures are primarily performed in the fluoroscopic suite. Lead author Shlomit Goldberg-Stein, MD, director of musculoskeletal intervention in the Department of Radiology’s Musculoskeletal Division, and co-authors state that the technique is both easy to perform and effective. The patient is placed in a lateral decubitus position with a radiodense marker placed over the hindfoot. The image detector is rotated to provide a true lateral view of the tibiotalar joint, which serves as a scout image. The image is then collimated to include only the posterior heel region in the imaged area, and the radiodense marker is adjusted to overlie the posterior superior aspect of the calcaneus within a few millimeters of the posterior cortex. After the skin is marked, and local anesthesia administered, a needle is then advanced in parallel with the image detector so that the needle tip overlies the hub. The authors explain that a fluoroscopic image at that point in the procedure should demonstrate a target appearance of the needle at the posterior superior calculus, due to the needle tip directly overlapping the needle hub. The needle is then advanced to the bone at the level of the posterior superior calcaneus once the needle angle has been optimized. Next, the needle is directed posteriorly into the RC bursa. A minimal volume of iodinated contrast injection confirms the needle position in the bursa (see image below) and 40-60 mg steroid is then injected. the needle tip prior to steroid injection. Outcomes of 30 patients who had 32 fluoroscopically guided injections were studied over a 10- month time period. All had had a diagnostic heel ultrasound exam prior to the treatment to assess for distal Achilles pathology and for the presence of RC bursitis. Patients were asked to rate their pain score from on a 0-10 scale prior to and within 30 days following the injection. The authors considered a clinically significant response to the treatment if patients had a 50% or greater reduction in the pain score. Over two-thirds of the patients (69%) experienced a clinically significant response, with 14% of the patients reporting that they were free of pain. No patients experienced any complications within 30 days following the injection. The authors point out that a portion of patients with RC bursitis often clinically present similarly to those with insertional Achilles tendinopathy. Patients in the study with Achilles tendinopathy but without RC bursitis, also benefitted from bursal injection. Golderg-Stein S, Berko N, Thornhill B, et al. Fluoroscopically guided retrocalcaneal bursa steroid injection: description of the technique and pilot study of short-term patient outcomes. Skeletal Radiol. 2016 45; 8: 1107-1112. Fluoroscopically-guided retrocalcaneal bursa steroid injection efficient and effective. Appl Radiol.